Hearts u19s returned to Penicuik for the opening friendly of the season and almost scored in the opening minute when Bald parried a Copil shot onto the post and then tipped the follow up over the bar for a corner. Minutes later Hearts came close with another shot, this time by Wagner, but his effort went narrowly past the post. Penicuik recovered from the early pressure and held their own for the next fifteen minutes and came close with a volley by Barr that went just over the crossbar. In the 22nd minute Bald was well positioned to save a header from a Copil free kick. Ten minutes later, the same player saw his shot curl narrowly past the upright. Hearts took the lead in the 35th minute when MULROONEY slotted home Copil’s curling cross to the back post. 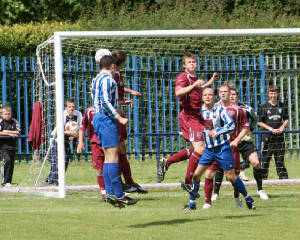 From the restart, Penicuik were awarded a free kick ten yards outside the penalty box. Gay struck the free kick well and Bjornsson was at full stretch to save low down to his right. Just before half time Gay fired off a powerful shot, but his strike flew high over the bar. Four minutes into the second half, Bald was relieved to see a shot get past him but go narrowly past the post. Hearts had made changes to their line up and they were now dominating the game. Then a long range shot by Hearts curled past the junction of the upright and crossbar. In the 53rd minute, Milne was inches away from connecting with a Gay free kick. Three minutes later, Moonie got past his marker send a great cross into the middle of the penalty box, but there were no takers there for Penicuik. Hearts doubled their lead in the 57th minute when the Penicuik defence was carved open and COPIL had the simplest of task to slot home from close range. From the restart, Hearts keeper Bjornsson raced out of goal to deny Gay. Then a lightning break by Hearts saw C THOMSON turn the Penicuik defence inside out and rifle home a shot into the bottom corner of the net. Three minutes later, Bald pulled off an excellent save to deflect the ball for a corner. However from the corner, BALATONI got in ahead of Bald to glance a header into the net. 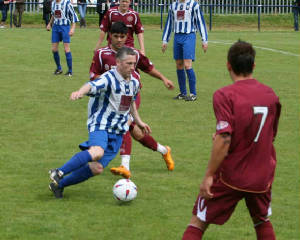 Penicuik were now under constant pressure and were finding it difficult to cope with the pace of the Hearts attack. In the 89th minute, C THOMSON scored the goal of the game with a scorcher of a shot from 25 yards that hit the back of the net before anyone in the Penicuik defence could move.